Our first meeting of 2012 will be a little different. Peter Gillies describes himself as a collector of magic lanterns, old magic lantern slides from all over Sussex and other optical toys. He will be presenting a magic lantern show, using a real magic lantern though now powered by electricity, and the sort of slides shown in Lewes entertainments over a century ago. This will be an interactive event, so be prepared for “Do you recognise where this was taken?”. Peter’s particular interests include the transport of the day and Sussex windmills (though he is still hoping his audiences will identify some of the windmills for him). He comes to us highly recommended. When this photograph of Grange Road was taken many of the houses were comparatively new. In the absence of traffic it was safe for young children to play out unaccompanied in the street. This Edwardian postcard, another from Funnell’s copyright series, High Street, Lewes, carries a 1905 postmark. 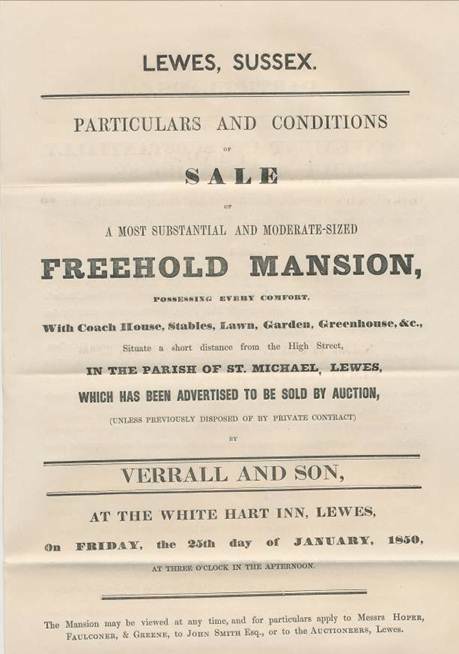 The property was described in the particulars as a convenient and substantially built mansion house with pleasure ground, lawn and garden, pleasantly situated in the parish of St Michael’s, Lewes, and late the residence of Mrs Courthope, deceased. On the first floor were spacious front and back entrance halls, an excellent stair case with a corridor, a dining room with four windows, about 28 feet by 16, a drawing room and library, each about 23 feet by 17, all of eleven feet pitch. There was a housekeeper’s room, a butler’s pantry, a famous kitchen and scullery, servants’ hall, dairy, pantry and two small garden rooms. On the next floor were six very good chambers and three dressing or bachelor’s rooms. On the upper storey were six servants’ sleeping and a large lobby, with a separate stair case. There was one other room for men servants and very excellent cellars. In a detached yard were a range of convenient offices, a washhouse with a laundry over, a double coach house and a four-stalled stable with lofts over. The mansion alone had a handsome frontage to the south of about 80 feet. The house was of solid brick work with stone window facings and cornice, and commanded excellent views. On the pleasure ground was an excellent dry terrace walk, ornamental plantations, summer house, green house, etc, etc, and the kitchen garden was protected by high walls. The purchaser would also have the option of taking at valuation three walled gardens contiguous to, heretofore used with, the house, and also two small pieces of pasture land. The property was freehold except for a small slip of land on the western side of the pleasure ground that was held by a 500 year lease from 29 September 1703, which was subject to a trifling quit rent of 1s 4d payable to the Lords of Lewes Borough. A land tax of £6 15s 0d was payable in respect of the property. The title deeds commenced with a conveyance dated 25 & 26 June 1787 between Henry Pelham Esq, and Jane his wife, of the first part, the Rt. Honble. Thos. Pelham of the second part, John Fredc. Hilditch of the third part and Edwd. Heather of the fourth part. The M.P. for Lewes was Rear Admiral P.H. Beamish, C.B. (Conservative) who had been elected at a June 1936 by-election, with a majority of 7,000 in a straight fight with a Labour opponent. Lewes Rural: Miss Agnes Ellen Hall, of ‘The Limberlost’, Edith Avenue, Peacehaven (first elected 1933). The aldermen included Humphrey Ranulph Brand of Glynde Combe, near Lewes (first elected 1922) and Arthur Norman Innes of ‘Narnton’, King Henry’s Road (1925). The Rt. Hon. The Viscount Gage of Firle Place, near Lewes, had represented Barcombe since 1931. The council’s senior alderman was Robert Lawrence Thornton, C.B.E. of High Cross, Framfield, who had first been elected in 1895. There were at this date 32 magistrates on the Lewes bench, including the Mayor of the Borough of Lewes. Many were local country gentlemen, including Viscount Gage and Humphrey Brand, while others came from Seaford and Newhaven. The magistrates with addresses in Lewes itself, with their dates of qualification, are listed below. John Henry Every, Esq, of The Croft, Lewes (1906). John Hills, Esq, of 59 Leicester Road, Lewes (1920). John James Lister, D.L., of ‘Fairhaven’, 8 King Henry’s Road (1886). Harva Tiller, Esq, of 3 Pelham Terrace (1920). Albert Turner, Esq, of ‘Holme’, Brighton Road (1934). Harry Willett, Esq, of ‘Paddock House’, Prince Edward’s Road (1912). In Governor of H.M. Prison, Lewes, in 1938 was Major Frederick Legh Richmond Munn. He had been born in 1889 and educated at Bromsgrove School and then Sandhurst. He had served in the Indian Army and seen war service in France, and in Waziristan in the Afghan War of 1919. He had served in Persia in 1919-1921 and in East Africa where he had commanded a company of the Kenyan Defence Force. He had been awarded a military cross and bar, and a D.S.O. He commanded the Sussex Heavy Battery of the Royal Artillery territorials. He was a member of the Lewes and County Club; his sport was fishing and his pastime cricket. Lewes was home to a division of the East Sussex County Constabulary. There was the Victoria General Hospital and a Hospital for Infectious Diseases. There was a St John Ambulance brigade based at 12 Mountfield Road and a Fire Station on North Street. This building, subsequently a chapel and now a residence, remains prominent in the streetscene. 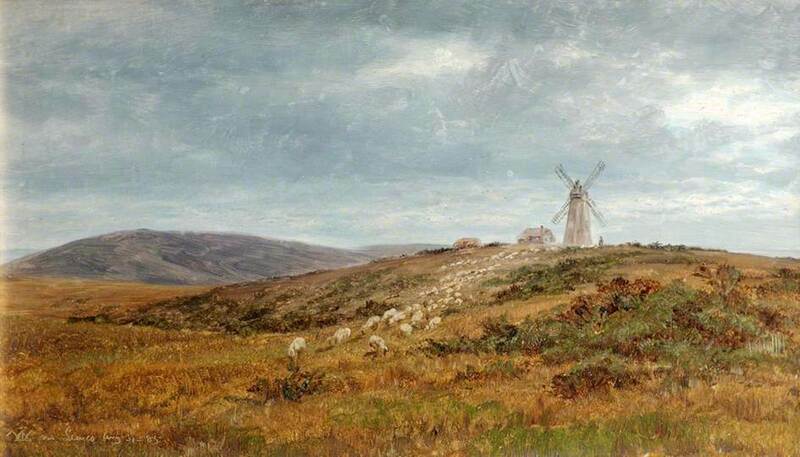 This 1865 oil painting by William Luker (1828-1905) is entitled ‘Landscape near Lewes, Sussex’. Owned by the Somerset County Museums Service, it is amongst the Lewes pictures in public collections listed online at http://www.bbc.co.uk/arts/yourpaintings/paintings. They would probably be very interested to know more about it. 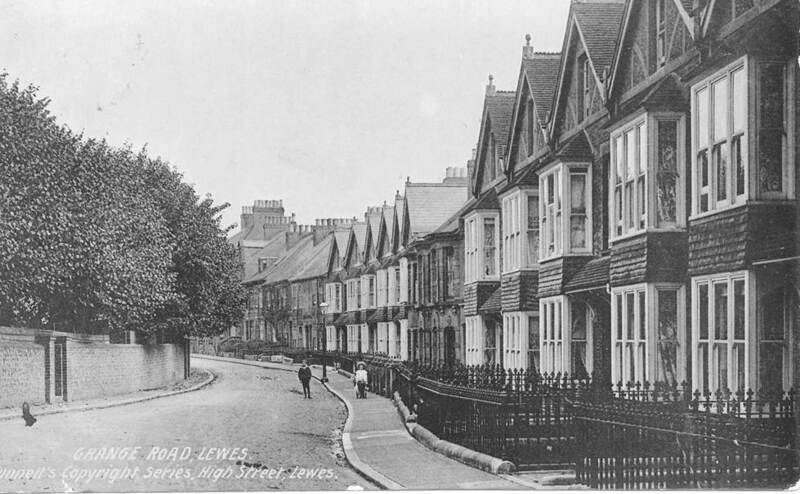 This entry was posted in Art & Architectural History, Lewes, Local History, Political History. Bookmark the permalink.